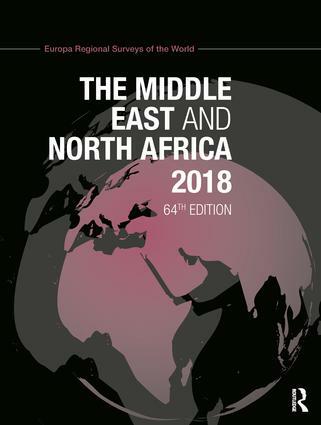 Now in its sixty-fourth edition, this title continues to provide the most up-to-date geopolitical and economic information for this important world area. - provides comprehensive data on all major organizations active in the countries of the region. - introductory essays cover a wide range of topics relating to the region as a whole. - a country-specific bibliography, providing suggestions for further research. - includes all major international organizations active in the Middle East and North Africa; research institutes specializing in the region; and select bibliographies of books and periodicals. Part 1: General Survey Part 2: Country Surveys Includes sections on geography, history and economy, as well as statistical surveys, directories and bibliographies for each country Part 3: Regional Information Regional Organizations. Calendars. Research Institutes. Select Bibliography (Books). Select Bibliography (Periodicals). Index of Regional Organizations.